A fortnight ago, the unthinkable happened. 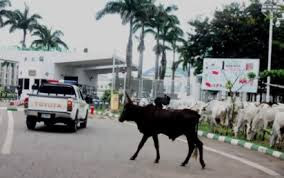 The National Assembly, located at the Three Arms Zone, Abuja, had some unfriendly visitors – cows. The cows and the herdsmen, numbering over 100, strolled into the well-fortified premises with unquestionable audacity. Their pilots, Fulani herdsmen, led them into the no-go area. They bypassed the first and second gates. They were heading for the main building, apparently to witness the day’s proceedings at the Red and Green Chambers, when security agents, who were hitherto snoring, suddenly woke up. They hurriedly went for the gate and locked it. Motorists and other road users, had to wait for the cows to have their right of way before embarking on their journey. Despite the presence of over 250 security agents attached to the National Assembly, cows had a free ride. The above scenario is a daily occurrence in Abuja, Nigeria’s capital city. From the highbrow Central Business District, to Aso Drive in Asokoro, Kubwa to Nyanya, herdsmen and their cows ply their trade unhindered. Since 2015, when the administration of President Muhammadu Buhari stepped in, the herders have become bolder. In front of the expansive Federal Secretariat, they ply their trade. Parts of the route leading to the Presidential Villa, herdsmen are found there grazing. Despite repeated promises by the Federal Capital Territory Administration (FCTA), to step in and stop the open grazing, it is yet to move a muscle, three years after. Instead, it looks the other way, while residents who now live in fear, are warning that the bloodbath in some parts of northern states, may soon spill over to Abuja. Residents who have taken to social media and other platforms to express their misgivings are questioning the job description of Abuja Environmental Protection Board (AEPB). For them, AEPB leaves the real deal and pursues shadows. Everyday, AEPB officials harass petty traders. They arrest and shame them openly. Their goods are seized and sometimes destroyed. In Abuja, AEPB officials harass and arrest women at night who they tag pros-titutes. There have been unconfirmed allegations that some of the arrested women offer s*x in exchange for their release. Others who are unlucky, face trial and are charged accordingly.